Rolling down the car windows and opening the sunroof can feel great on a summer day. But some drivers are warning that little pane of glass can bring unexpected risks. 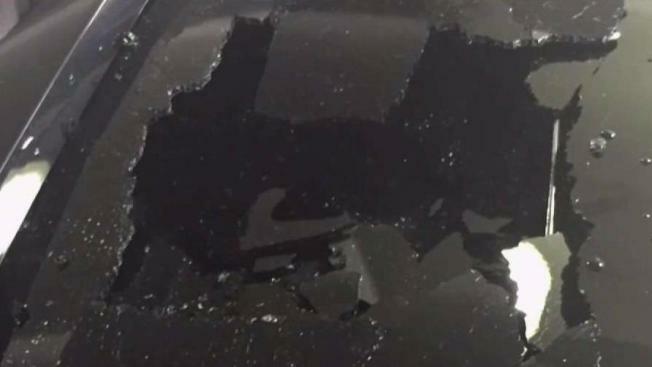 Giorgio Enea was driving his Mercedes GLA 250 down the freeway in Oakland, California last summer when he says the car’s sunroof spontaneously shattered. “I heard this incredible explosion in the car,” he said, adding that it sounded like a bomb. Hundreds of pieces of glass rested atop the sun shade, but there was no sign that anything hit the car. So when the Mercedes dealership told Enea that a rock was responsible for the damage, he was skeptical. “They never admitted that it was something else other than an external impact. But in my opinion I had something totally different than a regular rock hitting the car,” he said. Enea is not the only one who thinks so. Hundreds of people driving various vehicle brands across the country have reported similar instances to the National Highway Traffic Safety Administration. Augie Defeo, who owns Competition Glass, a car glass repair shop on Long Island, says his shop repairs 15 to 20 sunroofs a year. He blames how tightly the glass sits in the window frame. According to Consumer Reports vice president of advocacy David Friedman, the problem has increased over the past five years, especially with the prevalence of panoramic sunroofs. But despite the flood of complaints to NHTSA, little has been done to fix the issue. Senators Richard Blumenthal, D-Conn., and Edward Markey, D-Mass., sent letters to 20 different car companies in November 2017 requesting information about the reported defects, safety standards and companies’ awareness of the problem. “So far we’ve received no adequate answers,” Blumenthal said. Friedman alleges that instead of acknowledging the issue, the auto industry is blaming the consumer in an attempt to avoid paying to fix the problem. Enea, for one, was asked to sign a confidential release agreement that guaranteed he would not sue Mercedes for the incident. Though NHTSA opened an investigation into the problem in 2013, there are still no answers about what exactly causes the explosions. The type of glass and the size of the sunroof are both factors that may contribute to spontaneous shattering. One thing is for sure: these unexpected explosions pose a serious threat to drivers. Enea was not injured, but others may not be so lucky. “Imagine if you have small children sitting in the back of the car…anybody could have been totally hurt by the glass,” Enea said. And glass is not the only danger. “I can easily see the situation where a sunroof shatters, someone’s shocked, they stop paying attention to the road in the middle of an intersection and someone’s life is lost as a result,” Friedman said.